Samsung this week announced that it had started mass production of its new 8 TB NF1 SSDs. Samsung has been demonstrating prototype NF1 SSDs for slightly less than a year now, so it is not surprising that some of its customers are now ready to adopt them. The larger NF1 form factor allows for drives with double the capacity of M.2 SSDs, and they are aimed primarily at data-intensive analytics and virtualization applications that require higher performance and capacity than what M.2 can provide. 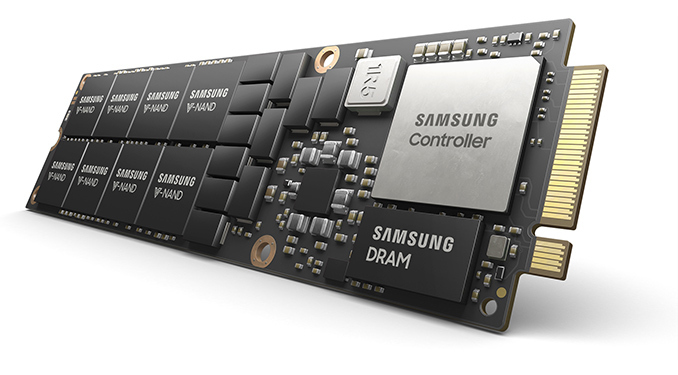 Update 6/22: Samsung made an update to its statements regarding the NF1 SSDs. The drives are based on the Phoenix controller, they do not use a PCIe 4.0 interface, but rely on a more traditional PCIe Gen 3 x4 interface. Samsung’s NF1 SSDs are based on the company’s 512 GB packages comprising of 16 layers of 256 Gb TLC V-NAND memory devices, as well as the company’s proprietary controller accompanied by 12 GB of LPDDR4 memory. Prototype NF1 drives used Samsung’s Phoenix controllers already used for client SSDs, early on Friday the company confirmed that the commercial NF1 SSDs are indeed the PM983 SSDs powered by the Phoenix controller. From performance point of view, the NF1 drives deliver sequential read speeds of 3100 MB/s and write speeds of 2000 MB/s. When it comes to random performance, the drives are capable of up to 500K read IOPS as well as 50K write IOPS. As for endurance, Samsung rates the drives for 1.3 DWPD. Two interesting points that Samsung mentioned in its press release was the fact that its NF1 SSDs enabled an undisclosed maker of servers to install 72 of such drives in a 2U rack for a 576 TB capacity and the fact that the drives used a PCIe 4 interface, a claim that was later retracted. All previous public demonstrations of NF1 SSDs were carried out on 1U servers based on Intel’s Xeon processors and there is also an NF1-compatible server from AIC based on AMD’s EPYC CPU. Samsung’s customer who uses the NF1 drives will likely identify itself in the coming months. In the meantime, the only shipping processor supporting PCIe 4 is the IBM POWER9, whereas the only PCIe 4-supporting switches are available from Microsemi. As for the 2U machine featuring 72 NF1 bays, it has not been publically announced yet. Samsung promises to start producing higher-capacity NF1 SSDs later this year. The company also says that JEDEC is expected to formally standardize the NF1 (aka NGSFF) spec this October. Update 07/05: Samsung has sent out an oddly timed correction some 2 weeks after the initial announcement, essentially disowning their comments on when NF1 is expected to be standardized. However their new statement also doesn't state that their estimate was incorrect, merely that they shouldn't have made it. "Samsung in a footnote to its NF1 announcement unintentionally exceeded its jurisdiction in estimating a possible time frame for completion of the JEDEC Next-generation Small Form Factor (NGSFF) standard. We regret the oversight."